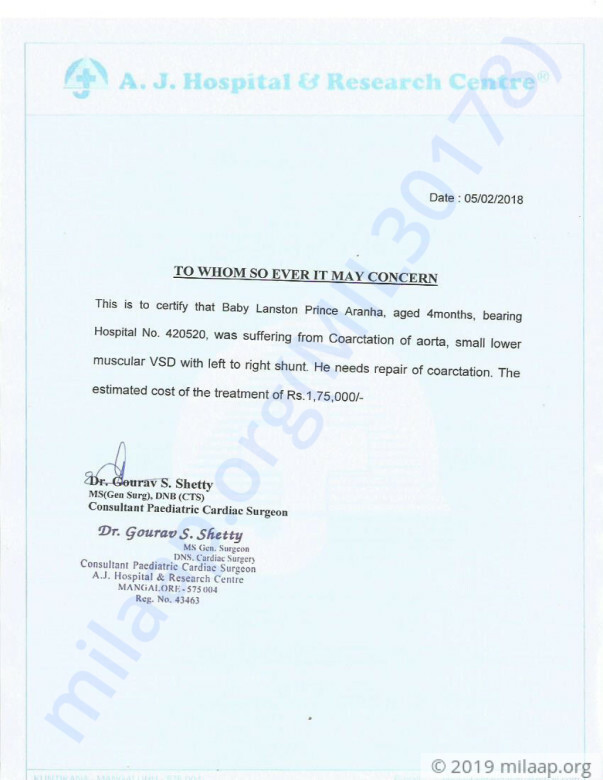 4-month-old baby Lanston, son of Lancy Aranha, is suffering from a severe heart disease called coarcatation of aorta. This disease is causing breathlessness. I apologies for a delayed update. As of now, Lanston is at home and he's doing well. Sometimes, he has breathing problems but he's currently under prescribed medication and living a normal and active life. He's on a normal diet and Doctors have suggested monthly check-ups for him to monitor his health but overall there's a significant improvement in his health. Thank you for the wonderful support that you have shown towards my son Lanston. He is doing better now and he successfully underwent the surgery on Friday, 16th February. He is still in the ICU under observation as per the doctor's advice. His respiratory problems have also reduced and the doctors suggest that once his health stabilizes we will be able to take him back home with us. I would like to thank you all for the wonderful love and support that you have shown towards my son. He has been able to recover so quickly all due to your blessings. Please do pray for his health and speedy recovery.